Make sure this browser window is not maximized to full size. You need to be able to see a piece of your Desktop. Go to the top of this window and look for the tab that says Amazon.com. Click on that tab, hold down your mouse button, drag the tab out of the window, and drop it on your desktop. Now you’ll have my instructions and Amazon’s pages both open in different windows. The link in (1) will take you to the web page in Figure 1. If you have an Amazon account and aren’t signed in, go ahead and sign in now. If you don’t have an account, move your mouse over “Your Account” at the top right (in blue oval in Figure 1) and a drop-down menu will pop up. Click on “New Customer? Start Here” to register an account. 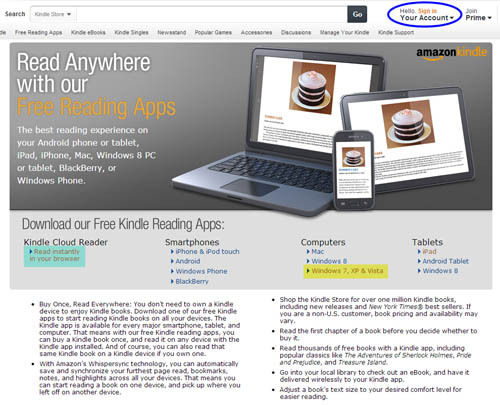 Under the middle section of the page–“Download our Free Kindle Reading Apps”–you’ll see all the available options for downloading. Go ahead and read that and the bulleted text while you’re on the page. (2) Click on the link for your specific computer system. On the Amazon Free Reading Apps page in Figure 1, under the Computers column, there are options for Mac and for Windows systems. For simplicity, the rest of this article assumes you’re downloading for Windows 7, XP & Vista (link highlighted in yellow in Figure 1). Whichever link you click on, it will will take you to a page similar to the one in Figure 2. (3) Download the application. Click on download now (inside the red oval in Figure 2). A window will open showing a folder on your PC where the installation file will be downloaded to. You can change the location if you want. You won’t need the file once you’ve install the program. 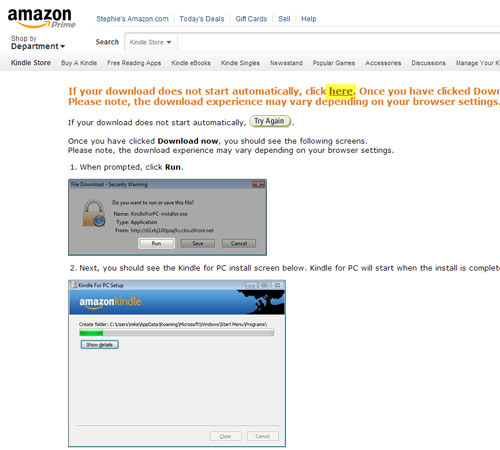 The application should download and Kindle for PC should open on your computer. If it doesn’t, click on the link (highlighted in yellow) in Figure 3 and follow their prompts. 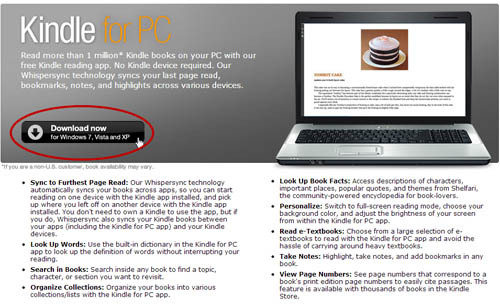 Figure 3 – The final Amazon window for installing Kindle for PC. Under Tools, click on Options, then Registration and make sure your Kindle for PC is registered to your Amazon account. If it’s not, you can’t have your books sent to it. Under Tools> Options> Content, you can check to see where the Kindle books are stored on your computer (e.g., in which folder) in case you want to place a kindle book there from a memory stick. Under the Tools menu, click on Sync and Check for New Items (or press your Function Key F5). Your Kindle books (those you paid for or free ones that you “purchased”) will show up in a minute or two. If your books don’t show up, click on Manage Your Kindle. That will take you to your Amazon account > Manage Your Kindle page, assuming you’re connected to the internet. Once you’re in the Manage Kindle account, to the right of a book title, you can mouse over the Actions button and click on Deliver to my … If you don’t have a Kindle reading device, your only choice will be Kindle for PC. You can view your library of books either as a list or as icons showing the book covers; see yellow highlight on Figure 4 which shows I have the rectangular icon image selected for the view so that I can see the book covers. You can click on the drop-down menu to sort by title, author, or most recent. Once you open a book, the collections pane goes away, as does the view buttons, but in their place will be a set of icons that allow you to change your background color, text color and size, number of reading columns, etc. Check all that stuff out. To the left will be three little icons — one’s for the Table of Contents, one is for searching within the book, and one displays your notes. So go ahead and get started by going to the Kindle Book section of Amazon. Click to the left on the category you want. To the far right of the page should be a list of Kindle Best sellers with two tabs. The tab on the right is for the Top 100 Free. If you see something you want to read, click on it. Make sure the Kindle Price is still listed as $0.00 and Buy now with 1-Click!